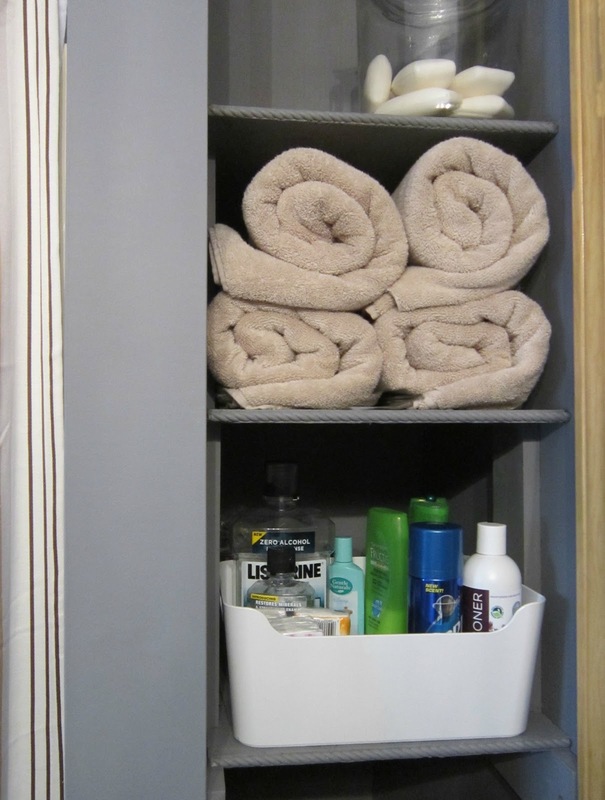 Design Megillah: Bathroom Redesign for Under $200! 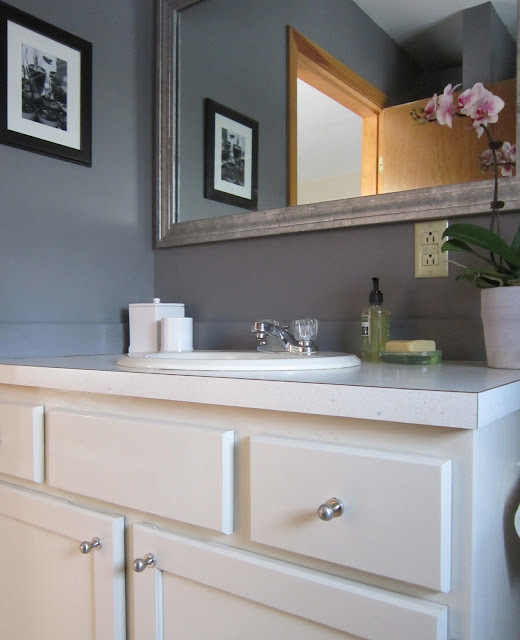 Bathroom Redesign for Under $200! Remodeling bathrooms can be expensive. Ripping out tile, toilets, or showers that are outdated or flat-out falling apart costs enough--and that’s before you even think about replacing them with new ones! If you don't have the money to totally remodel a bathroom (or you have a rental, as the case was here) here's how to make it look great on a tight budget, as shown below. This was a bathroom that was U-G-L-Y! The good news was it was in good shape--no broken tiles, no plumbing problems--just needed some updating and a good dose of style. The most dramatic change here was color. The "before" color was a weird shade of yellowish/green. 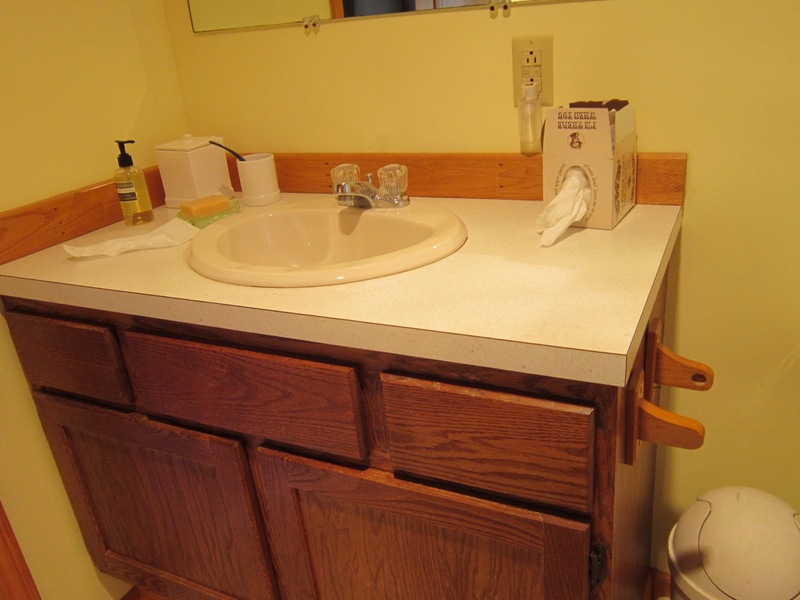 The wood vanity was ho-hum brown. 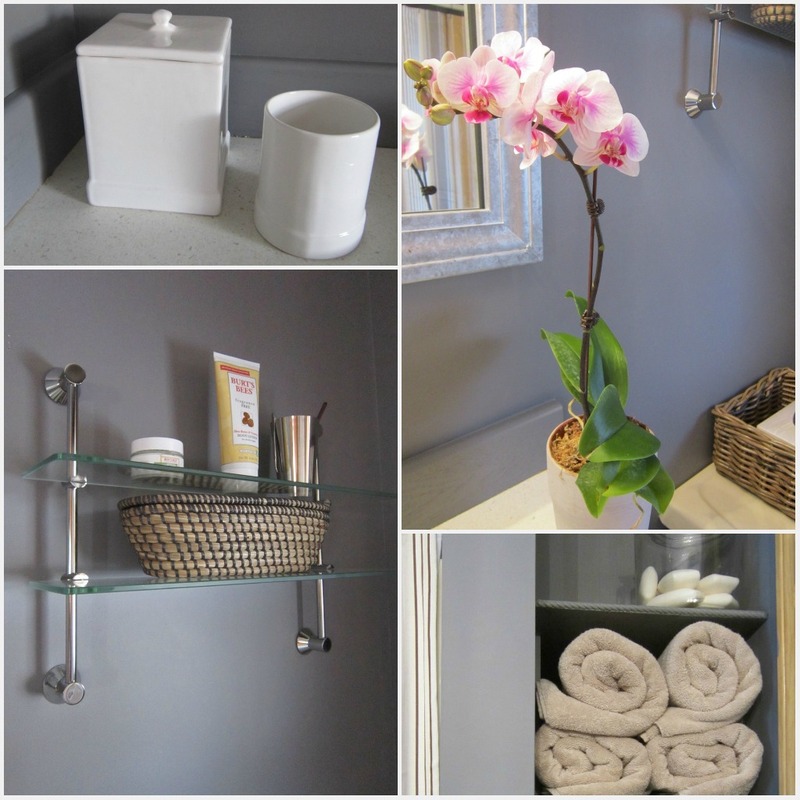 The new color is "Cinder" from Benjamin Moore's Aura Bath & Spa paint line. Not only did this paint cover the walls in less than two coats, but it stands up to hot, humid conditions, provides a mildew resistant coating, and is low VOC and low odor. The vanity got a few coats of a soft taupe and some new sleek knobs from Ikea. 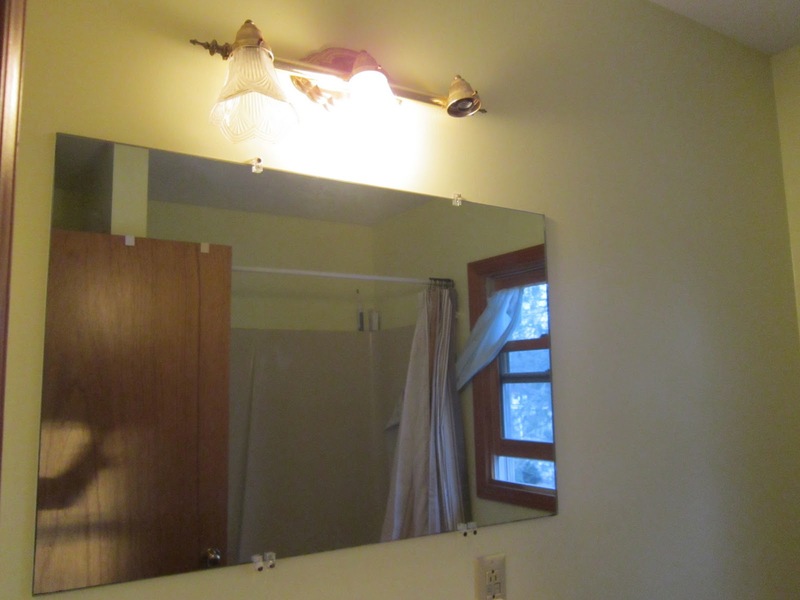 The old light fixture and the Plain-Jane mirror didn't do much to help the look of the vanity area. 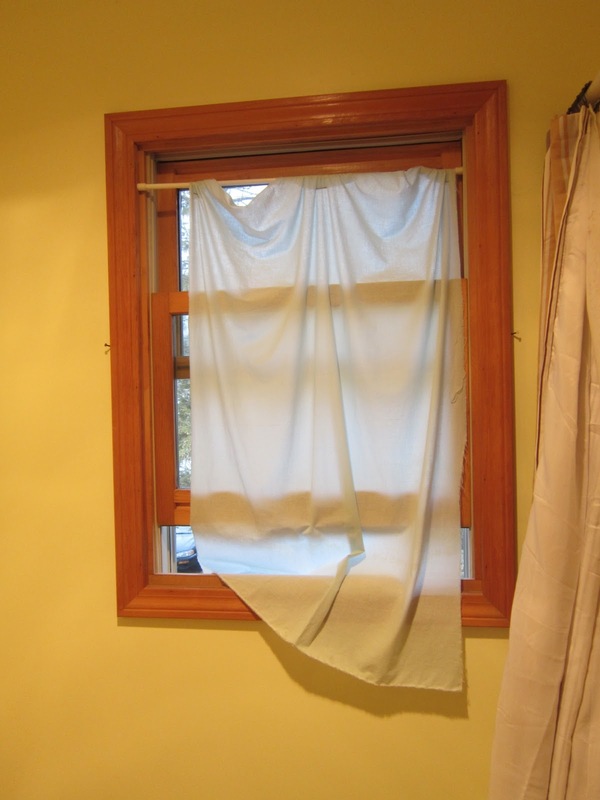 Some easy, inexpensive tricks were used here. 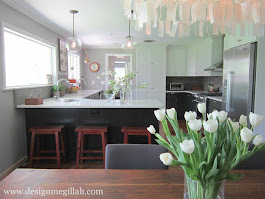 First, the light fixture was painted the same dark grey as the walls. Now, it blends into background and you don't notice the unattractive fixture. Next I bought three seeded glass shades (for six dollars each!!!) 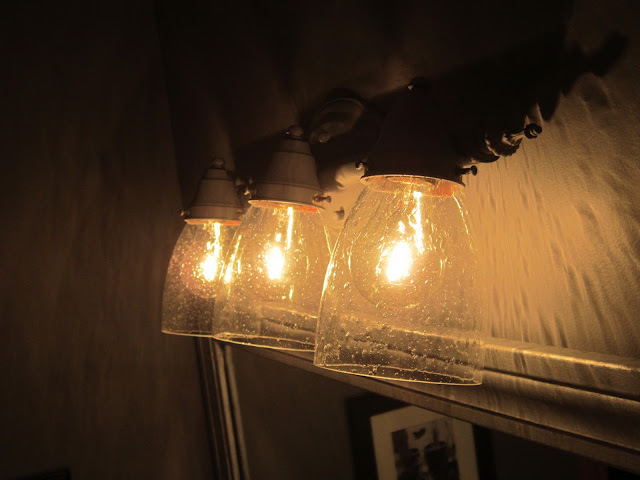 and clear light bulbs from Lowe's--it gives the light a whole new look! Same for the mirror--chair molding was cut to size and mitered by the guy at my lumberyard. 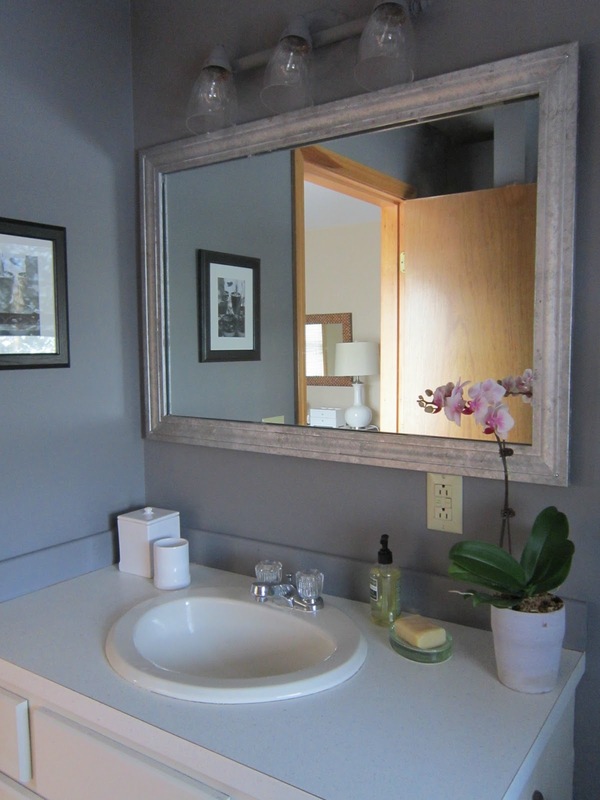 It adds a "frame" to the mirror and makes it looks custom! 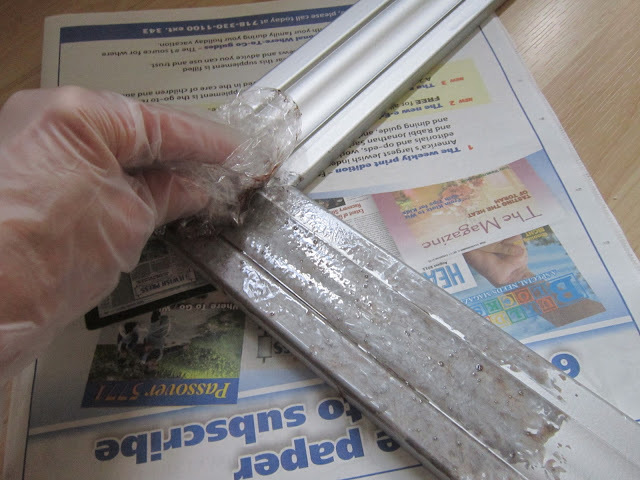 I gave it a coat of silver spray paint, and then dabbed some brown glaze (with plastic wrap) to give it an antique look. The shade was meant to be temporary when the family moved in, but two years later, it was still here. 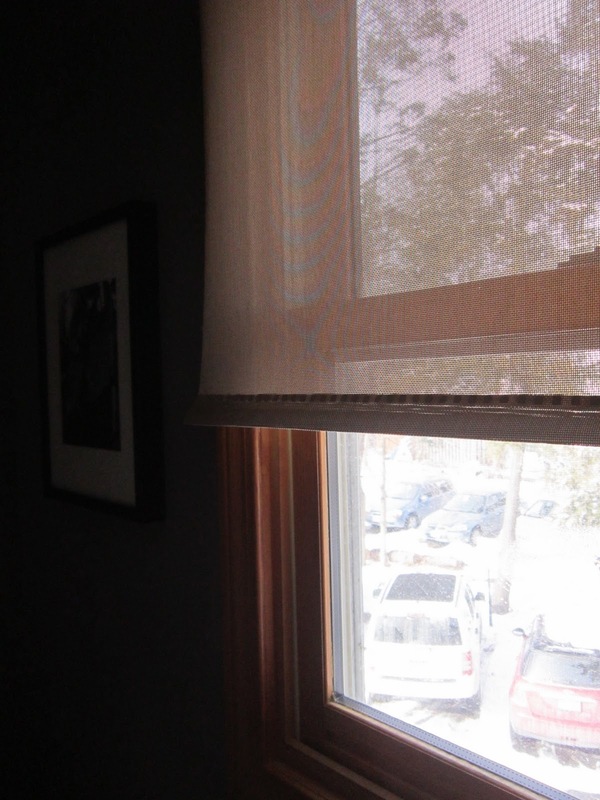 Although the new Levolor Solar Shade stays down most of the time it lets light into the room during the day. They can see out but outside can't see in. 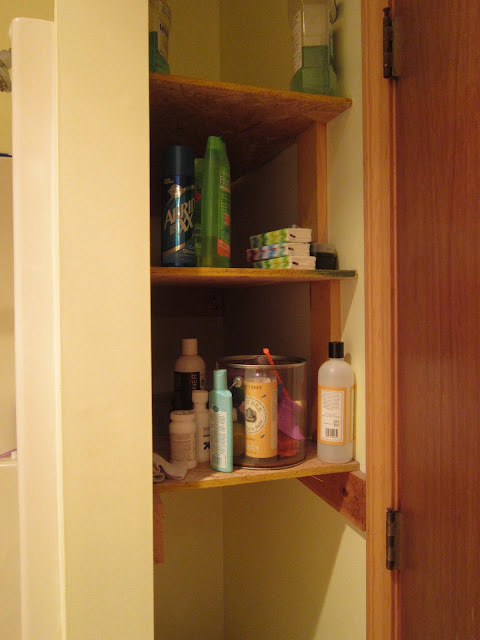 These shelves were a good idea for extra storage, but the wood was not finished and they were not used efficiently. By adding some trim to the edges and painting them the same color as the walls, they are the perfect place to store extra bath towels, shampoos and a glass container filled with soap. 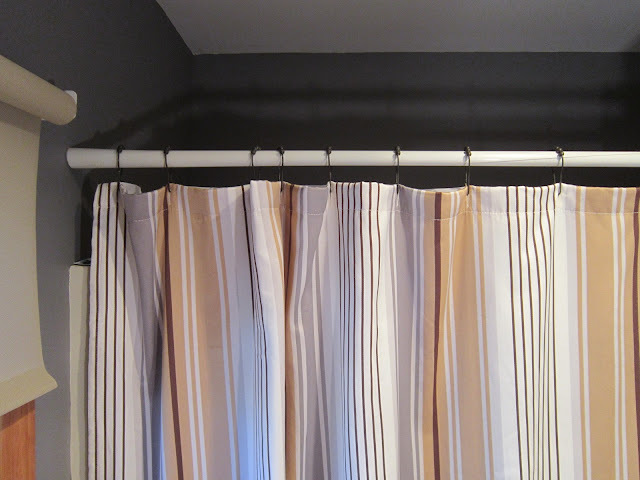 Don't forget the shower curtain--it adds tons of color and softness to a "hard" room. Last but not least, are the details. Even a bathroom needs art, decorative shelving, and pretty accessories. 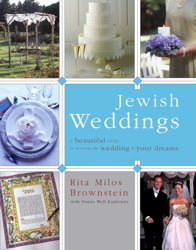 Just discovered your blog from a link on Shabby Nest. Loved the vases and looking around at all of your past projects. Enjoyed all of your holiday decorations! 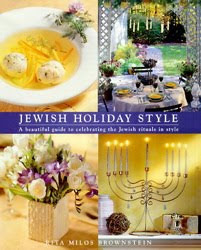 Shabbat Shalom! It looks like an expensive renovation. Love the color, the lights and mirror! I wonder what could be done with the outlet above the sink? they can be tricky to disguise. Beautiful bathroom! 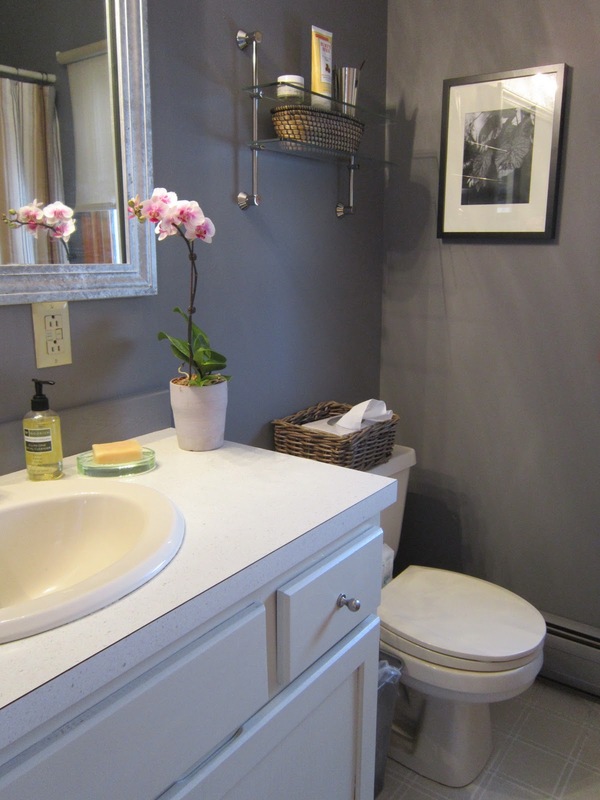 I love the paint color and the small pop of pink from the orchid. Great job! Rita, this looks so nice & peaceful!! Very well done...looks like you spent a fortune instead of just $200! 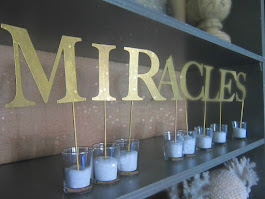 Thank you bunches for linking this up with Mop it Up Mondays at ishouldbemoppingthefloor.com! It was so sweet of you to stop by. Wow wonderful task process news informed for every home makers. It through all presents information collection from here! Thanks for sharing.